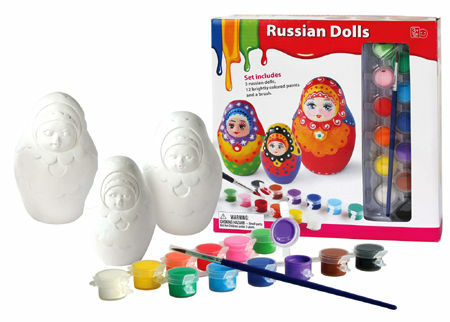 This is a very simple painting and design toy. All you have to do is decide what colours your creation should be and then start painting using the 12 color pots and paint brush. Please note the finished dolls are for display and do not nest inside each other. Size: box is 21cm x 7cm x 21cm, Dolls are 3 different sizes from approx 12cm tall. Material: Paper Clay, Paint, brush. We like this because: "Lovely simple craft fun and not to hard to get a really lovely result." The train whistles arrived today and I wanted to thank you so very much for getting them to me so quickly. They are perfect, exactly as I had hoped. You’re prices are exceptional too!! I really do thank you sincerely.